Johannesburg, South Africa - an international team of researchers led by scientists from the University of the Witwatersrand's Evolutionary Studies Institute and the South African Centre for Excellence in PalaeoSciences today announced in two papers, published in the South African Journal of Science, the discovery of the most ancient evidence for cancer and bony tumours yet described in the human fossil record. 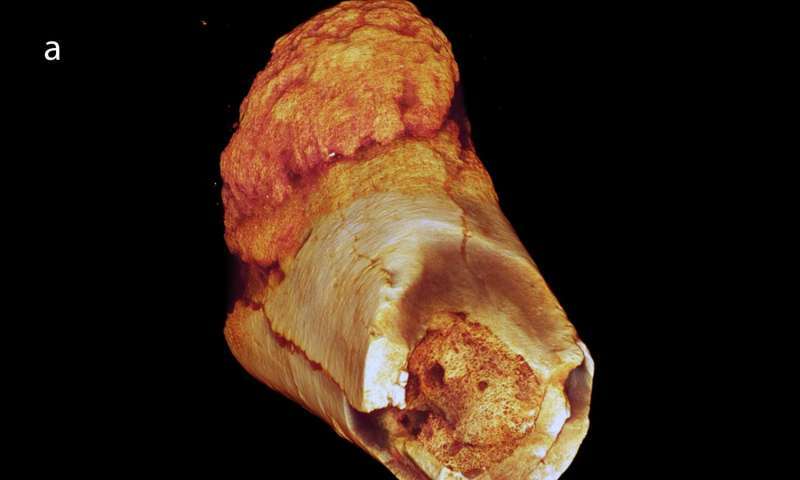 The discovery of a foot bone dated to approximately 1.7 million years ago from the site of Swartkrans with definitive evidence of malignant cancer, pushes the oldest date for this disease back from recent times into deep prehistory. Although the exact species to which the foot bone belongs is unknown, it is clearly that of a hominin, or bipedal human relative. 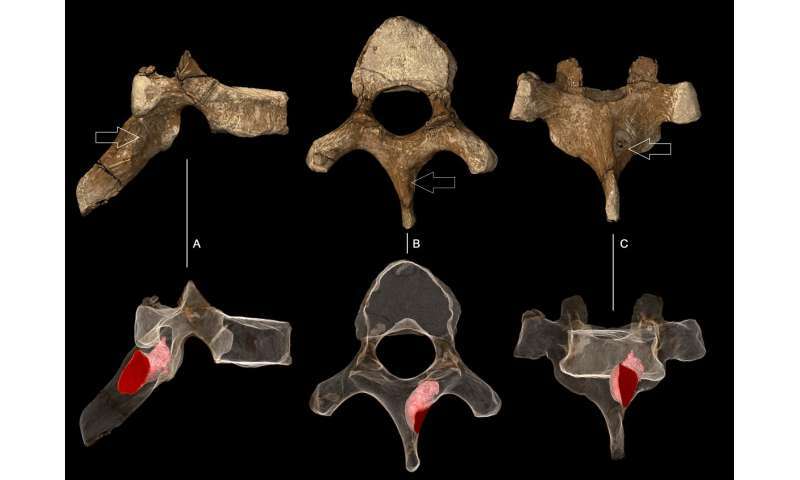 In an accompanying paper appearing in the same journal, a collaborating team of scientists identify the oldest tumour ever found in the human fossil record, a benign neoplasm found in the vertebrae of the well-known Australopithecus sediba child, Karabo from the site of Malapa, and dated to almost two million years in age. 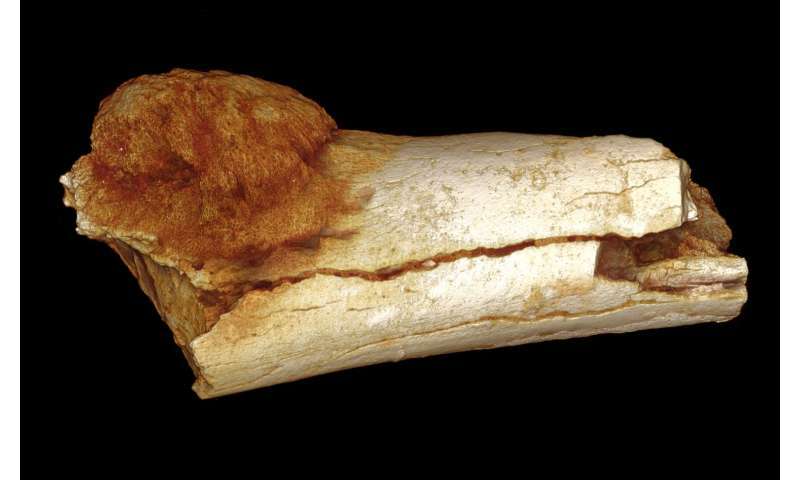 The oldest previously demonstrated possible hominin tumour was found in the rib of a Neanderthal and dated to around 120,000 years old. Edward Odes, a Wits doctoral candidate and lead author of the cancer paper, and co-author on the tumour paper, notes "Modern medicine tends to assume that cancers and tumours in humans are diseases caused by modern lifestyles and environments. Our studies show the origins of these diseases occurred in our ancient relatives millions of years before modern industrial societies existed". The cancer in a foot bone, a metatarsal, was identified as an osteosarcoma, an aggressive form of cancer which usually affects younger individuals in modern humans, and, if untreated typically results in early death. "Due to its preservation, we don't know whether the single cancerous foot bone belongs to an adult or child, nor whether the cancer caused the death of this individual, but we can tell this would have affected the individuals' ability to walk or run," says Dr Bernhard Zipfel, a Wits scientist and an expert on the foot and locomotion of early human relatives. "In short, it would have been painful." Lead author of the tumour paper and co-author of the cancer paper, Dr Patrick Randolph-Quinney of Wits University and the University of Central Lancashire in the UK, suggests "The presence of a benign tumour in Australopithecus sediba is fascinating not only because it is found in the back, an extremely rare place for such a disease to manifest in modern humans, but also because it is found in a child. This, in fact, is the first evidence of such a disease in a young individual in the whole of the fossil human record". Prof. Lee Berger, an author on both papers and leader of the Malapa project where the fossil vertebra was found adds "not only has there been an assumption that these sorts of cancers and tumours are diseases of modernity, which these fossils clearly demonstrate they are not, but that we as modern humans exhibit them as a consequence of living longer, yet this rare tumour is found in a young child. The history of these types of tumours and cancers is clearly more complex than previously thought". Both incidences of disease were diagnosed using state of the art imaging technologies including those at the European Synchrotron Research Facility in Grenoble, France, medical CT at the Charlotte Maxeke Hospital in Johannesburg, and the micro-CT facility at the Nuclear Energy Corporation of South Africa at Pelindaba. "Researchers in South Africa are at the forefront of using various X-Ray modalities to discover new and interesting facts about ancient human relatives," notes Dr Jacqueline Smilg, a radiologist based at Charlotte Maxeke Hospital, who is an author on both papers and was involved in the clinical diagnoses. "This is another good example of how the modern clinical sciences and the science of palaeoanthropology are working together in South Africa and with international collaborators to advance our understanding of diseases in both the past and the present."